However, often we are interested not in the overall trend, but in the anomalous points. For example, why did a particular Tuesday have extremely high usage at 6:00am? It could have been due to a large gathering or a special event on the day. If we have a calendar listing of events that have taken place at each hour, how can we visualize and account for events on a time series chart like this? The two cases handle both timed events, and all-day events. Next, we clean up the data using some dplyr routines. since we’d need to know the events that happened at every hour. 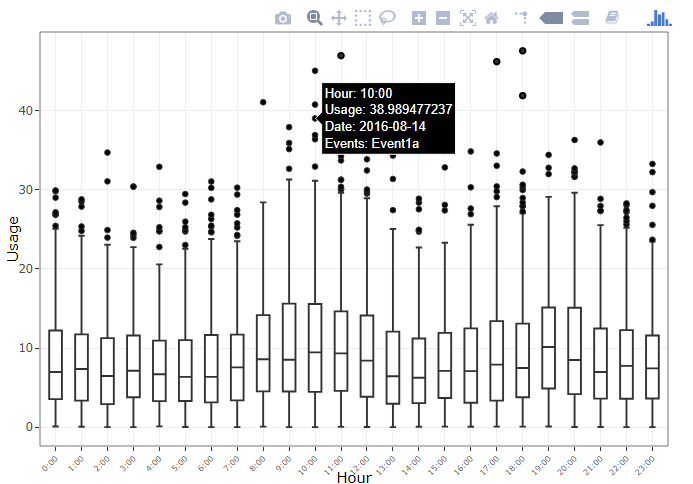 Now we are ready to combine the usage data with the calendar data and add to our plots. And we see that some of the during some of the most high usage hours there were certain events happening which could explain the usage.